LIDAR is a popular remote sensing method used to examine the surface of the Earth. LIDAR instruments use light in the form of a pulsed laser to measure ranges (variable distances) and generate vast amounts of precise three dimensional point data describing the shape of the Earth. Processing large collections of point cloud data and combining them with auxiliary GIS data remain an open research problem. 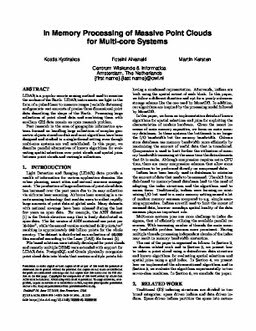 Past research in the area of geographic information systems focused on handling large collections of complex geometric objects stored on disk and most algorithms have been designed and studied in a single-thread setting even though multi-core systems are well established. In this paper, we describe parallel alternatives of known algorithms for evaluating spatial selections over point clouds and spatial joins between point clouds and rectangle collections.